Boyfie and I were looking for new things to do during weekends, aside from the usual pigging out. I came across news about Repertory Philippines' Shakespeare in Hollywood and bought tickets. Truth be told, I was feeling neutral. I am not much into theater and practically clueless about Shakespeare's plays. I can't even remember the last play I attended (a requirement during my student days more than a decade ago). I've always considered theater actors much more talented and dedicated than their on-screen counterparts though, and with that I decided to get out of my cave and get a little culture. A no holds Bard Comedy! Commissioned by the Royal Shakespeare Company, Shakespeare in Hollywood had its world premier in 2003 at Arena Stage and won the Helen Hayes award for Best New Play of the Year. The play was a pleasant surprise for me. It was very entertaining, very funny. A perfect mix of fictional characters and real life Hollywood folks. No wonder it won that Best New Play award! 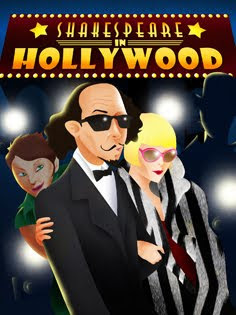 If you're not familiar with the celebrities depicted in the play, you will still enjoy the play. If you're a movie buff fond of classic Hollywood, you'll like the play even more, since its characters include Max Reinhardt, Jack Warner (of Warner Brothers) and the indefatigable censor Will Hays (author of the very strict Hays Code the film industry had to follow then). I can't throw a single criticism at Repertory Philippine's performance. My only complaint goes to the management of Greenbelt 1. During some parts of the play, you could hear people hammering outside. A nearby unit was probably being constructed or renovated. The hammering was a bit distracting. I would have expected Onstage to be soundproof or at least for the management to inform tenants of nearby outlets to do construction work after the mall has been closed. Another thing I noticed was that a big part of the audience was composed of foreigners. I wish more Filipinos would see plays. A New Yorker friend and I were discussing this topic a few months before. Going to plays is a regular thing for him and his friends. Meanwhile, here, if you go to see plays or art exhibits, you're labeled a pretentious art snob or a hipster. A shame, really. Anyway, I'm looking forward to seeing more plays and other performance art. Being categorized as a part of the "jologs" sector of Philippine society, watching this play seems to have elevated my status.